Gnanambigai, J., Rengarajan, D.R., Anbukkarasi, K.
1 (3), pp. 15-22. Cited 25 times. 1 (2), pp. 22-25. Cited 20 times. 1 (2-6), pp. 6-10. Cited 9 times. 2 (1), pp. 100-105. Cited 8 times. 1 (3), pp. 56-60. Cited 6 times. Abinaya, V., Vennila, M., Padmanabhan, N.
(2014) Proc. of International Journal of Communication and Computer Technologies, 2 (2). Malakar, S., Mohanta, D., Sarkar, R., Nasipuri, M.
(2010) International Journal of Communications and Computer Technology, 2, pp. 120-124. Cited 3 times. Ramahrishnan, S., Elakkiya, B., Geetha, R., Vasuki, P., Mahalingam, S.
(2014) International Journal of Communication and Computer Technologies, 2 (5), pp. 44-48. Cited 2 times. Jeevanand, D., Keerthivasan, K., Mohamed Rilwan, J., Murugan, P.
(2014) International Journal of Communication and Computer Technologies. Cited 2 times. (2014) International Journal of Communication and Computer Technologies, 2 (12), pp. 70-77. Cited 2 times. Atchaya, S., Dhanalakshmi, N., Veeramani, R.
(2014) International Journal of Communication and Computer Technologies, 2 (1), pp. 1-4. Cited 2 times. (2013) International Journal of Communication and Computer Technologies, 1 (72), pp. 265-269. Cited 2 times. Vijay, V., Gowri, K., Velmurugan, S., Basha, A.M.
(2016) International Journal of Communication and Computer Technologies, 4 (4). Cited 1 time. (2016) International Journal of Communication and Computer Technologies. Cited 1 time. (2016) International Journal of Communication and Computer Technologies, pp. 4059-4064. Cited 1 time. (2016) International Journal of Communication and Computer Technologies., 4 (2), pp. 4007-4011. Cited 1 time. (2014) International Journal of Communication and Computer Technologies, 2 (2), pp. 1-5. Cited 1 time. Jeba Pon Elizabeth, S., Vedhapriya Vadhana, R.
(2014) International Journal of Communication and Computer Technologies, 2 (10). Cited 1 time. (2014) International Journal of Communication and Computer Technologies, 2 (2). Cited 1 time. Kavitha, P., Keerthana, C., Niroja, V., Vivekanandhan, V.
(2014) International Journal of Communication and Computer Technologies, 2 (2), pp. 56-63. Cited 1 time. (2014) International Journal of Communication and Computer Technologies, 2 (3), pp. 39-42. Cited 1 time. Jayasinghe, J.W., Anguera, J., Uduwawala, D.N. (2014) International Journal of Communication and Computer Technologies, 2 (1). Cited 1 time. (2014) International Journal of Communication and Computer Technologies, 2 (9). Cited 1 time. (2014) International Journal of Communication and Computer Technologies, 2, pp. 2278-9723. Cited 1 time. (2014) International Journal of Communication and Computer Technologies, 2. Cited 1 time. Srivastava, K.A., Yadav, K.D., Pandey, K.S. (2013) International Journal of Communication and Computer Technologies, 1 (4). Cited 1 time. (2013) International Journal of Communication and Computer Technologies. Cited 1 time. (2013) International Journal of Communication and Computer Technologies, 1 (12). Cited 1 time. Nandhini, J., Nithya, M., Prabhakaran, S.
(2013) International Journal of Communication and Computer Technologies, pp. 156-161. Cited 1 time. (2013) International Journal of Communication and Computer Technologies, 1 (47). Cited 1 time. (2013) International Journal of Communication and Computer Technologies, 1 (57). Cited 1 time. (2013) International Journal of Communication and Computer Technology. Cited 1 time. Kumar Srivastava, K., Tripathi, A., Kumar Tiwari, A. (2013) International Journal of Communication and Computer Technologies, 1 (12), pp. 78-89. Cited 1 time. (2013) International Journal of Communication and Computer Technologies, 1 (57), pp. 198-202. Cited 1 time. Shoeb, M., Kumar Gupta, V.
(2013) International Journal of Communication and Computer Technologies, 1 (38). Cited 1 time. 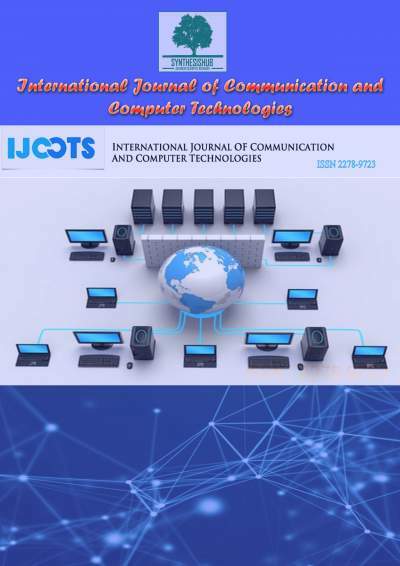 (2013) International Journal of Communication and Computer Technologies (IJCCTS), 1 (5), pp. 123-128. Cited 1 time. "An Overview: PAPR in OFDM Systems and its Effects"
(2012) International journal of communication and computer technology, 1 (2). Cited 1 time. Gnanambigai, J., Rengarajan, N., Anbukkarasi, K.
(2012) International Journal of Communication and Computer Technologies, 1. Cited 1 time. (2012) International Journal of Communication and Computer Technology, 1 (1), pp. 26-32. Cited 1 time. (0000) International Journal of Communication and Computer Technologies, 1 (57), pp. 186-191. Cited 1 time. Goyal, D., Hemrajani, N., Paliwal, K.
(0000) International Journal of Communication and Computer Technologies, 1 (60), pp. 208-211. Cited 1 time. (0000) Predicting the Number of Blood Donors Through Their Age and Blood Group by Using Data Mining Too International Journal of Communication and Computer Technologies, 1. Cited 1 time. (0000) Dr.N.Rengarajan#2,K.Anbukkarasi#3 International Journal of Communication and Computer Technologies, 101 (2-3). Cited 1 time.